An irritating hum that seems to come from everywhere at once alerts you that you’ve probably arrived too late to stop the ritual. Though the peculiar trappings of this cult’s bizarre and bloody arcana are strewn about the crumbling stone altar, not a single robed figure is present. Puzzled, you circle the foul edifice and a strange vista abruptly snaps into view, as though someone had ripped a hole in the air only ever seen from this exact spot. Through the hole, you see limp, robed figures scattered across the floor of an entirely alien chamber. It looks as though the cultists did not survive their trip, but something else moves among the still forms. A spongy appendage attached to the creature’s conical body swings towards you, and you are suddenly struck by how strange it is to be looking back at yourself through the tear. You simultaneously see and feel yourself starting forward, beginning to reach through the rip in reality. The hum in your head urges you a bit closer… closer… but then the unmoving forms of the robed figures spring back into your mind. You close your eyes and shake your head, the hum subsides, and the image of yourself disappears from your vision. Realizing you are drenched in cold sweat, you turn quickly and flee, an enraged howl echoing faintly as the hum fades from your mind. 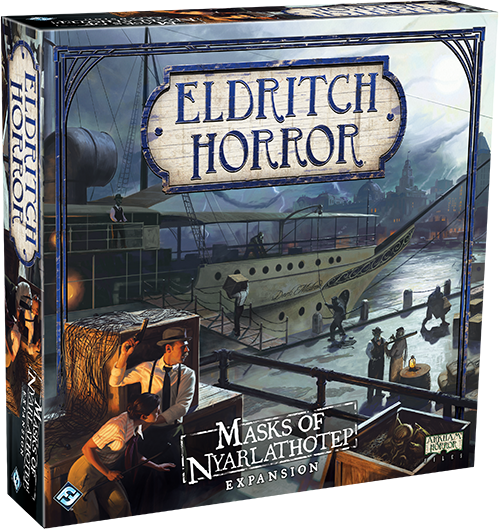 In Masks of Nyarlathotep, the newest expansion for the Lovecraftian board game Eldritch Horror, particular celestial bodies have aligned and hidden cults have begun to enact grotesque rituals in remote locations all over the world. Are these cults working towards one common goal? Does each group have its own aims? The investigators must work to cover an extraordinary amount of ground as they seek out the hidden objectives of these clandestine cultists. You can pre-order your own copy of Masks of Nyarlathotep at your local retailer or online through our webstore today! Then, read on for more information. In Masks of Nyarlathotep, the cultists appear to be conducting rites that grant passage to long-vanished cyclopean cities at the height of their power in aeons long past. 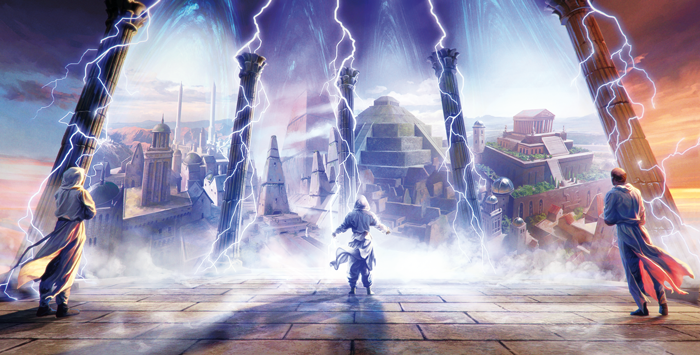 One of the two new Ancient Ones available in this expansion, the Antediluvium, brings investigators face to face with these lost locales through a new deck of Mystic Ruins. 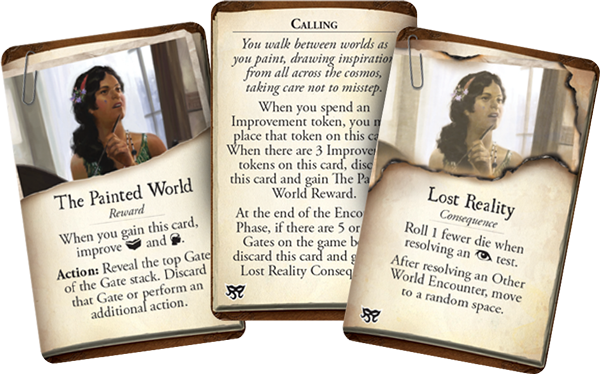 First introduced in the Mountains of Madness expansion, Mystic Ruins are locations that offer portals to other places and times, filled with strange beings, mind-bending secrets, and powerful relics. Access to these sites pop up only one at a time as the cultists must focus their energies to force open a passage to these otherworldly places. 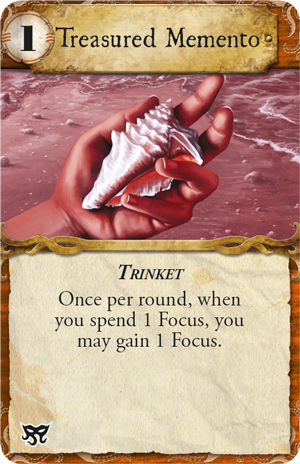 Undertaking a Location Encounter on any space with a Mystic Ruin token usually yields opportunities to close gates, acquire Unique Assets or Talents, or move the Omen track without advancing Doom. Investigators may be called to seek out the lost continent of Mu, deep beneath the waves of the Pacific Ocean, or uncover the secrets of Hyperborea far in the frozen north. Many more of these ruins await discovery by the investigators, and they would be wise to seek out these same powers that the cultists will twist to their nefarious ends. Clearly the ruins you walk among were once seats of great power, but who knows what these cultists seek in those ancient realms? Though the cults that are scattered across the globe are many and varied, the Order of Rising Stars is a name whispered by many, and their name speaks to the celestial alignment that has set all of this in motion. Could they be the common thread? Only one thing is certain: time grows short for the investigators. The stars crawl across the night sky, inching ever-closer to an alignment in the heavens that could spell doom for the world. 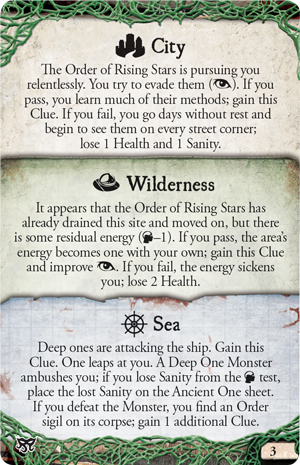 Whether the threat comes from the Order of Rising Stars or some other hidden group of hooded occultists, the investigators would be wise to add some new blood to their ranks in order to stand against the encroaching darkness. Sefina Rousseau is a remarkably talented painter, though she has more often applied her skills to forgery than the creation of new works. After a strange client asked her to reproduce an especially fascinating cityscape, Sefina found herself pulled into the very locale she had created. Now, while Sefina searches for answers about the bizarre cities that she cannot purge from her mind, she is also stalked by those who would use her unique talents to puncture the veil between worlds. Sefina will never allow her talents be used to bring abominable creatures into our world. Sefina is keenly observant, and begins the game with a Treasured Memento, the very anchor that she believes helped her return home from the shores of that strange and distant world she visited. Sefina may often literally lose herself in her paintings, but practice will make perfect. 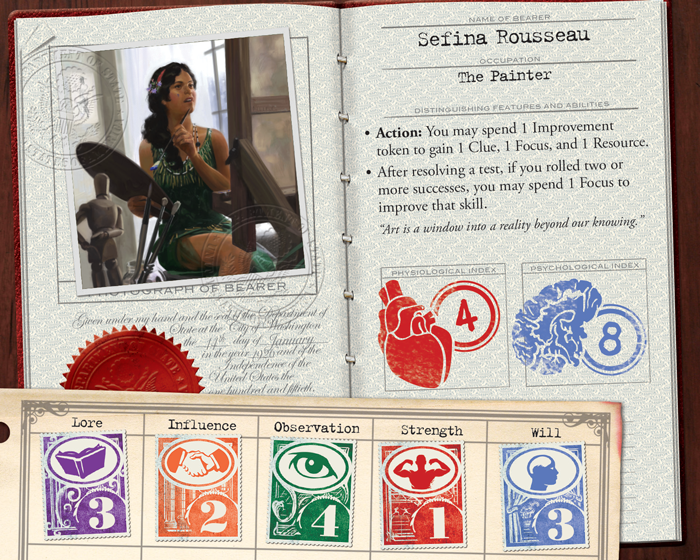 With Sefina’s Personal Story in play, players can gain her Reward by spending improvement tokens—using her prescient paintings as a way to reveal and potentially discard the top Gate. But be wary of ignoring Sefina’s need to improve her skills—if too many Gates enter the fray before Sefina has gained her Reward, her penchant for slipping the bonds of space and time will make Other World Encounters more of a risk. When it comes to encountering other worlds, Calvin Wright knows more about the other side of the veil than he cares to admit. Calvin made a deal that saved the love of his life and granted him incredible durability, but cast a dark shadow over his soul. Calvin’s strength and his lack of willpower are boosted by the Spirit Dagger that he starts with, having gained the weapon during his many brushes with the occult. Now, Calvin travels the world, seeking only to rescue as many souls as he possibly can before he is consumed by the darkness inside himself. Calvin’s commitment to self-sacrifice has made him a lifeline for others, able to trade the health of his own body and mind to assist a friend in need. Calvin refuses to let down the people who depend on him, and Calvin’s continued self-sacrifice may actually be a path to retaining whatever is left of his soul. 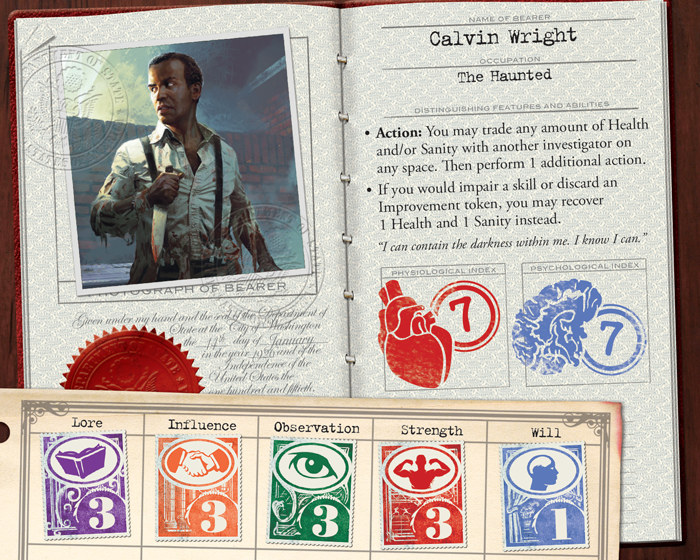 If Calvin gives enough of his health to a fellow investigator, he’ll gain a Reward that boosts his meager Will and raises his maximum health and sanity. 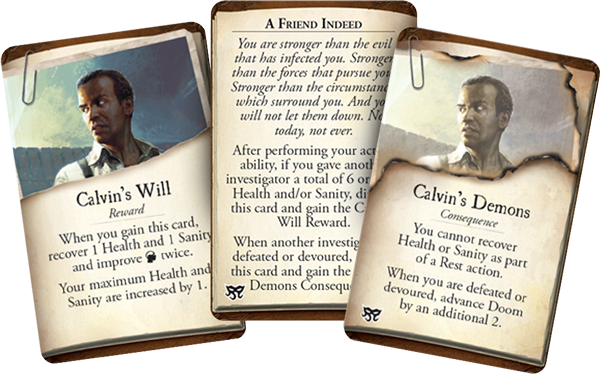 Unfortunately, if any fellow investigator meets an untimely demise before Calvin gains this Reward, the demons that Calvin’s been fighting for so long start to finally wear him down. Calvin will find it harder to recover from his injuries, and, if Calvin should be consumed by the darkness, the demon’s victory pushes the world that much closer to its end. 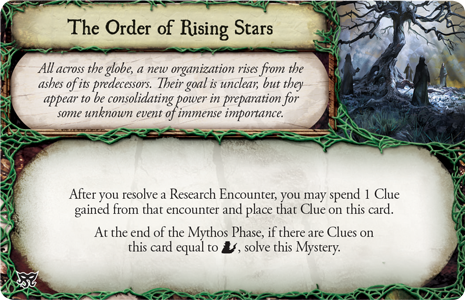 Each investigator’s Personal Stories add a unique aspect to every character’s battle against the cults that threaten to bring the Ancient One into our world from beyond the stars. As gates to other times and strange worlds continue to open at sites of ancient civilizations across the globe, the question remains: what fell purpose drives these cults? What single implacable will drives our world to the brink of destruction? 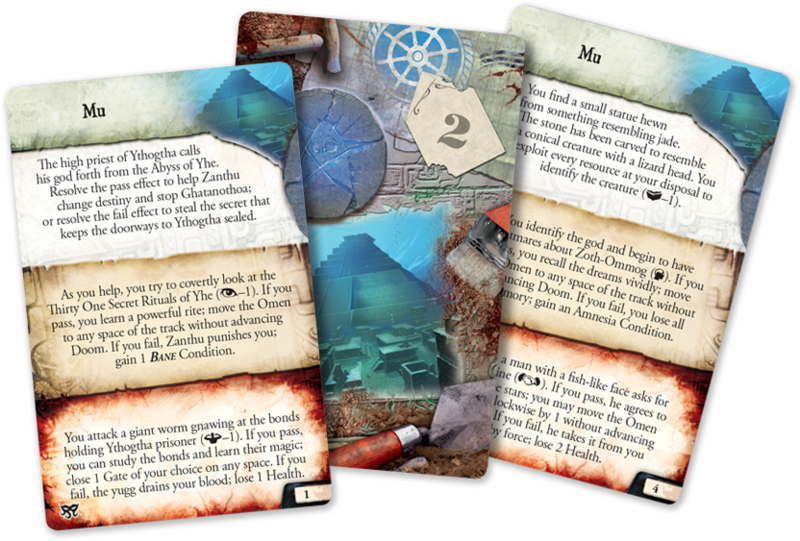 Find out more in our future previews and make sure to pre-order your copy of Masks of Nyarlathotep (EH09) from your local retailer or from our website here!